Gallery view of the 2017 presentation of “Quilt National” at Foundry Art Center. This year’s exhibit is presented October 4-December 6, 2019. Pictured: Hollie Regalo. Metastasis. 2016. Cotton Embroidery Thread on Linen, 12”x12”. This work received Best of Show in Missouri Fiber Artists’ 2017 “Speaking of Fiber: An Altered Environment” exhibit. 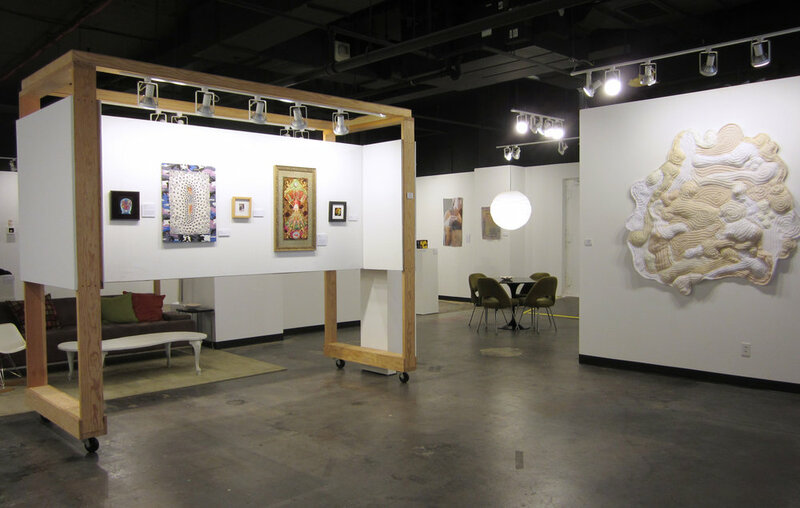 Gallery view of Art Saint Louis’ “Fiber Focus 2015” exhibit. This year’s exhibit is presented September 28 through October 24, 2019. Jane Olson Glidden. Crossroads. 2017. Handwoven Fabric, Cotton & Habu Paper Yarn, Embellished with Paper Eyelash Yarn, Surface Dyed using Rust & Tea, 12"x12". Glidden is a member of Weavers' Guild of St. Louis. Bits Art Quilters artist Deb Akin. Mud Lotus Pods. 2018. Mud Dye, Machine Quilting, Hand Embroidery, 14.5"x18". Photo: Cindy Bell Neville. Pictured: artist Andrea Vail's work Collecting_Pile: Horizon 2 (2018). 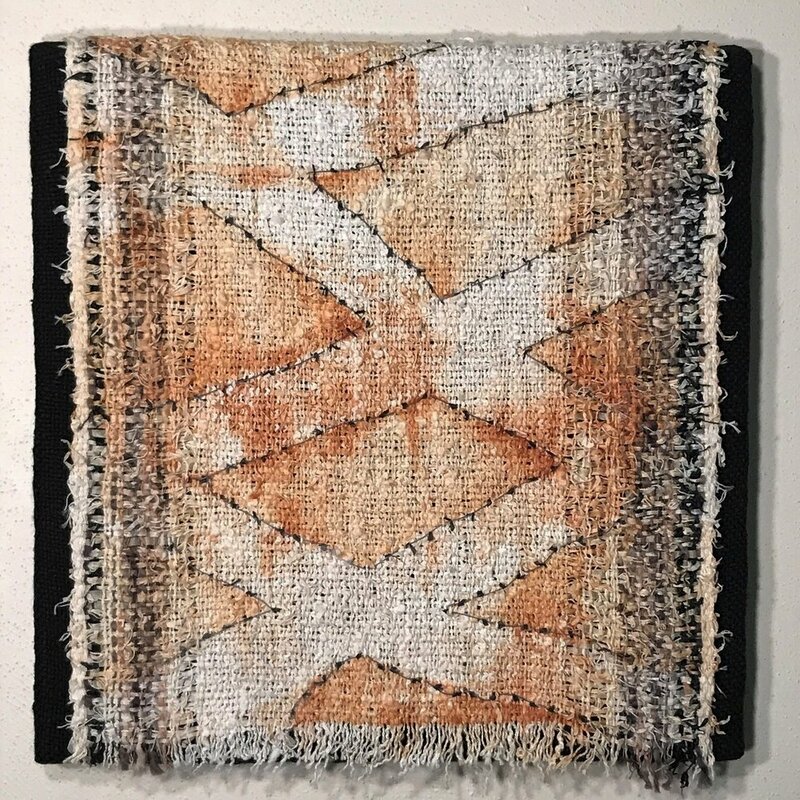 Vail's work will be featured in "Teach/Taught: Fiber Art Educators," curated by Rena Wood for Meramec contemporary Art Gallery, September 26-October 19, 2019. Contemporary Art Museum St. Louis presents "Stephanie Syjuco: Total Fabrications" on view September 6-December 29, 2019. Pictured: Stephanie Syjuco. Neutral Calibration Studies (Ornament + Crime). 2016. 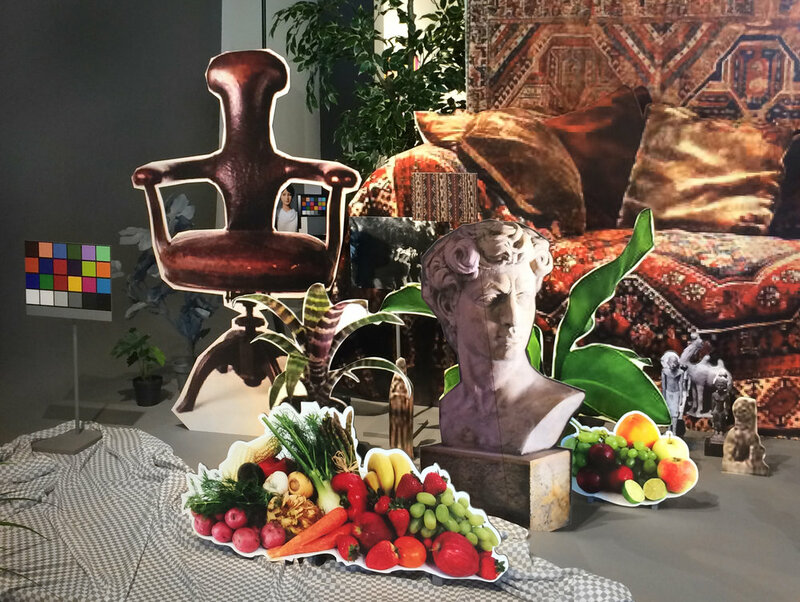 Wooden Platform, Neutral Grey Seamless Backdrop Paper, Digital Adhesive Prints on Laser-Cut Wooden Props, Dye-Sublimation Digital Prints on Fabric, Items Purchased on eBay and Craigslist, Photographic Prints, Live Plants, Neutral Calibrated Gray Paint, 10'x20'x8'. Courtesy the artist and Contemporary Art Museum St. Louis. The Mildred Lane Kemper Art Museum presents “Paintings without paint,” a special presentation on Saturday, October 5 with Meredith Malone, associate curator. Pictured: Sergej Jensen (Danish, b. 1973), Untitled. 2010. Sewn Fabrics, 106 1/2 x 133 3/4". Mildred Lane Kemper Art Museum, Washington University in St. Louis. University purchase with funds from the David Woods Kemper Memorial Foundation, 2011. Pictured: Leandra Spangler. Cycle of Four. 2016. Eco-print on Paper (eucalyptus), Artist-Made Paper, Eco-print on Cotton Fabric, Embroidery Floss, Palm Inflorescence, 12"x12"x1". Spangler is a member of Weavers' Guild of St. Louis. StL area textile artist Deb Lewis will included in ArtFiber Saint Louis’ exhibit at Good Shepherd Arts Center during IT19. Pictured: Leakage. 2018. Hand Stitched cotton, Alcohol Ink-Dyed monoprint, 12”x12”. Pictured: Sun Smith-Fôret, Alton, IL. Ritual Vessel Series, "Japonaise". 2018. Textile Sculpture: Knotting, Crochet, Beading, 5"x5.5"x5.5". 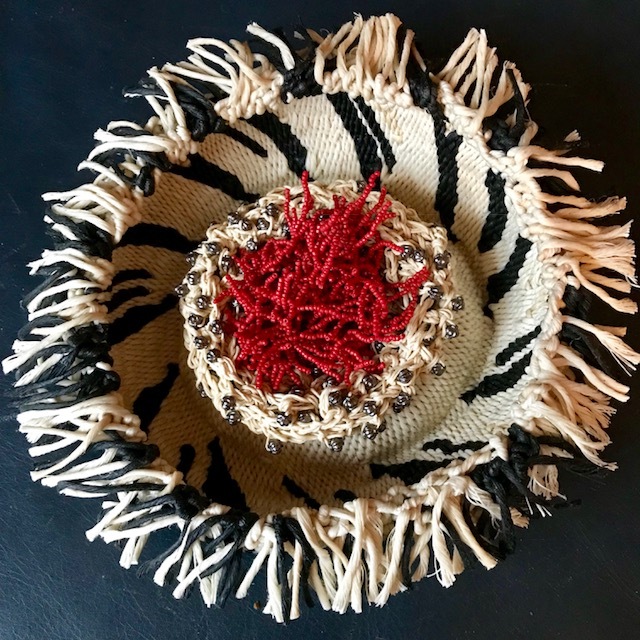 Smith-Fôret will exhibit her mixed media nests/baskets at Duane Reed Gallery in September during IT19. Highlight from Missouri Fiber Artists’ 2015 “Fiber Content III” exhibit (2015) at Framations Art Gallery. Pictured: Jacque Davis. Moonfire. Mixed Textile. Messing Gallery at MICDS presents an exhibit of works by Lindsay Obermeyer on view October 25-November 29, 2019. Pictured: Lindsay Obermeyer. Leucocyte 2. 2004. Bead Embroidery on Silk, 20" Photo by Larry Sanders. Gallery view: Missouri Fiber Artists’ 2015 “Fiber Content III” exhibit at Framations Art Gallery (2015). 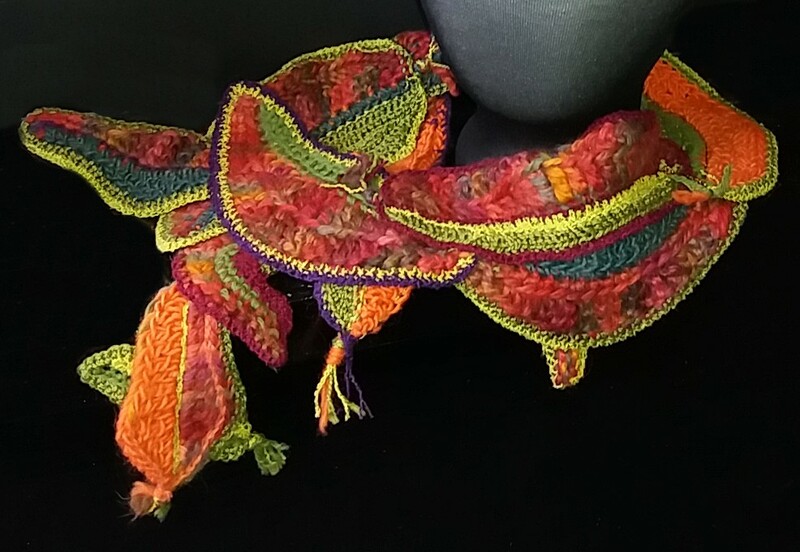 "Cascade Scarf" by Kacey Cowdery, St. Louis, MO. featured in "Darling! You Look Smashing," Missouri Fiber Artists' 2017 exhibition at Framations Art Gallery. Pictured: Gallery view of Weavers' Guild of St. Louis' 2013 exhibit, "That's Paper?!?" Photo: Jane Olson Glidden. The Monday Club of Webster Groves presents “Reflections on Cloth,” Kelsey Viola Wiskirchen, September 8-October 29, 2019. Pictured: Kelsey Viola Wiskirchen. Being with Hannah. 2017-18. Hand-Embroidery; Cotton Thread on Linen, 40"x24". Photo credit: Carl Valle. Norton’s Fine Art & Framing presents “Paper & Thread: Dreams are Made of These,” Deann Rubin & Betty Shew, handwoven tapestry & cast paper (October 2019). Pictured: Betty Shew. Dwelling Place. Handcast Paper, Arcylic, Found Objects, 11"x14.5". Highlight from Missouri Fiber Artists’ 2015 “Fiber Content III” exhibit at Framations Art Gallery. Pictured: Gloria Henderson. Before the Fall. Embroidery. 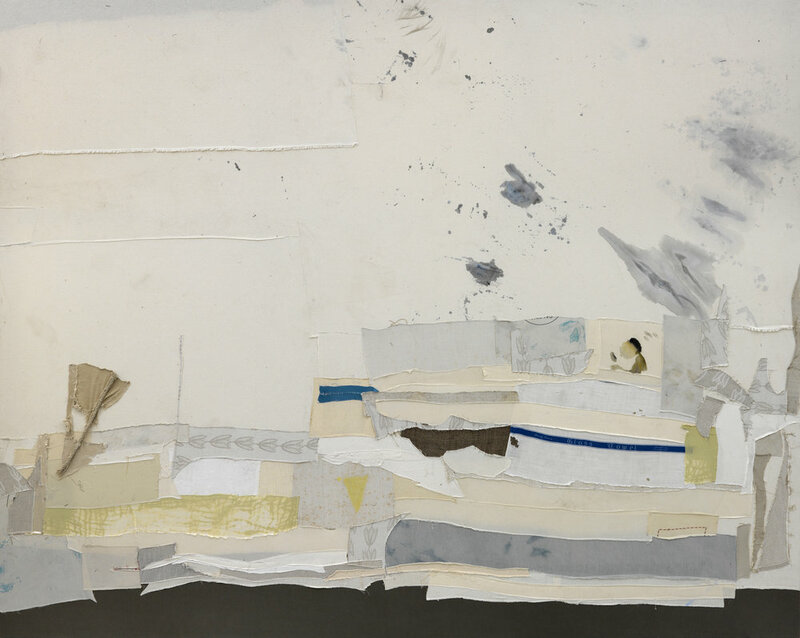 Craft Alliance Center of Art + Design presents “Fidencio Martinez-Perez: Cuttings” on view August 23–October 21, 2019. Horsley Arts presents “Japanese Meisen Kimono & Needle Festival Tributes” on view September 27-November 2, 2019. Featuring mid-20th century Japanese silk kimonos from the collection of Wendy Wees. Designs are inspired by Western Art Nouveau and Art Deco. Pictured: Early 20th century Meisen Kimono (detail). Hand Sewn Meisen Silk, 4’x4’8”. Courtesy of Wendy Wees. Messing Gallery at MICDS presents an exhibit of works by Lindsay Obermeyer on view October 25-November 29, 2019. Pictured: Lindsay Obermeyer. Leucocyte 3. 2004. Bead Embroidery on Silk, 20" Photo by Larry Sanders. Pictured: Sun Smith-Fôret, Alton, IL. Mind Catcher Series, “Undersong.” 2018. Textile Sculpture: Knotting, Crochet, Beading, 9"x9"x2". Smith-Fôret will exhibit her mixed media nests/baskets at Duane Reed Gallery in September during IT19. Sharon Kilfoyle, "Arashi Shibori Pleated Scarf" featured in "Darling! You Look Smashing," Missouri Fiber Artists' 2017 exhibition at Framations Art Gallery. Pictured: Weavers' Guild of St. Louis member Leandra Spangler. (detail) Grace. 2016. Eco-Print Cotton Fabric, Silk Organza with Gold Leaf, Embroidery Floss, Sewing Thread, Palm Infloresence, 12"x12"x1". Highlights from the Innovations in Textiles 2015 bus tour stop at Craft Alliance to see “Speaking with Threads” curated by Jane Sauer. Contemporary Art Museum St. Louis presents "Stephanie Syjuco: Total Fabrications" on view September 6-December 29, 2019. Pictured: Stephanie Syjuc. Neutral Calibration Studies (Ornament + Crime). 2016. Wooden Platform, Neutral Grey Seamless Backdrop Paper, Wooden Platform, Neutral Grey Seamless Backdrop Paper, Dye-Sublimation Digital Prints on Fabric, Items Purchased on eBay and Craigslist, Photographic Prints, Live Plants, Neutral Calibrated Gray Paint, 10'x20'x8'. Courtesy the artist and Contemporary Art Museum St. Louis. Cindy Bell Neville. Untitled. Featured in Bits Art Quilters' "Totems: Personal Stories in Fiber" at Bluebird Park. Photo credit: Cindy Bell Neville. Pictured: Kacey Cowdery. Infected. Collage. This work received Honorable Mention in Missouri Fiber Artists’ 2017 “Speaking of Fiber: An Altered Environment” exhibit. Messing Gallery at MICDS presents an exhibit of works by Lindsay Obermeyer on view October 25-November 29, 2019. Pictured: Lindsay Obermeyer. Ischemic. 2016. Bead Embroidery on Needle Felted Sphere, Vintage Buttons, 4.5" Photo by Larry Sanders. Artist Sun Smith-Fôret of Alton, IL will exhibit her mixed media nests/baskets at Duane Reed Gallery during IT19. Bits Art Quilters artist Becca Baumann. The Eye of the Storm. 2018. Needle Felting, Thread, 18"x20". Photo: Cindy Bell Neville. Norton’s Fine Art & Framing presents “Paper & Thread: Dreams are Made of These,” Deann Rubin & Betty Shew, handwoven tapestry & cast paper (October 2019). Pictured: Deann Rubin. Yellow Jester. 2017. Handwoven Tapestry, Cotton, Silk, Wool, 8"x8". Bits Art Quilters artist Jane Falconer. Children of the Corn. 2018. Painted Fabric, Machine Thread Drawing, 18"x18". Photo: Cindy Bell Neville. Highlights from Art Saint Louis’ “Fiber Focus 2015” opening reception. Pictured are exhibit Juror Marci Rae McDade and featured artist Shin-hee Chin. This year’s exhibit is presented September 28 through October 24, 2019. Contemporary Art Museum St. Louis presents "Stephanie Syjuco: Total Fabrications" on view September 6-December 29, 2019. Pictured: Stephanie Syjuco. Rogue States. 2018. Installation View: This Site is Under Revolution at the Moscow Museum of Modern Art, June 6–July 12, 2018. Twenty-Two Digitally Printed Flags, 5'x3' each. Courtesy the artist and Contemporary Art Museum St. Louis. Pictured: Highlights from Weavers' Guild of St. Louis' 2016 exhibit, "Timeless Fibers" held at the Gallery at the University City Public Library. Photos: Jane Olson Glidden. Missouri Fiber Artists member Jennifer Wax. Tribute. Layered Embroidery. Jane Sears Falconer. Untitled. Featured in Bits Art Quilters' "Totems: Personal Stories in Fiber" at Bluebird Park. Photo by: Cindy Bell Neville. Innovations in Textiles STL 2019 is a collaborative event presented Fall 2019 throughout the St. Louis region—including St. Louis County, St. Louis City, St. Charles, Columbia, Missouri, as well as Metro East Illinois. Innovations in Textiles STL 2019 serves to enlighten the community with a unique aesthetic perspective on fiber art. 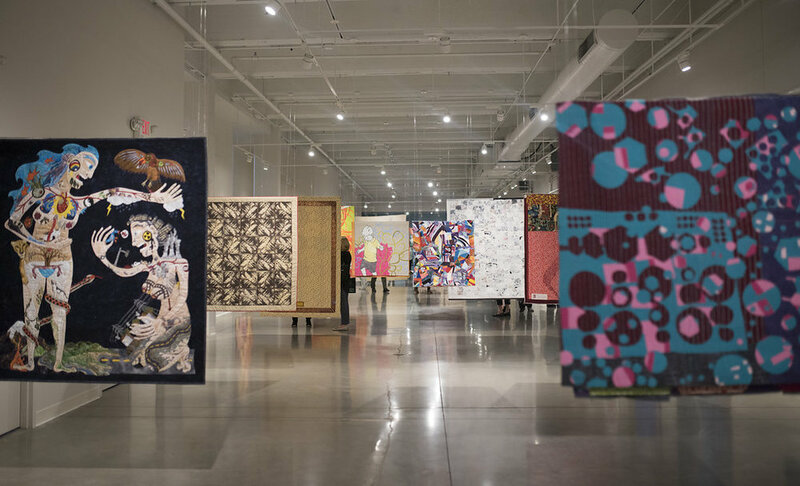 Created to investigate the state of contemporary textile arts, Innovations in Textiles 2019 is comprised of over 40 regional nonprofit & commercial art galleries, organizations and museums that have joined forces to present innovative exhibitions that explore fiber art, textiles and fashion created by local, regional, national, and international artists. In addition to exhibitions, a broad range of artistic programming & activities is planned, including receptions, open houses, workshops, lectures, gallery talks, studio tours, a bus tour, and other community programs throughout Fall 2019. Innovations in Textiles 2019 will take place August through November 2019 with a special weekend of events with Surface Design Association scheduled October 3-6, 2019. Stay tuned to this website and our Events section for more info. regional community with a unique aesthetic perspective on fiber art." 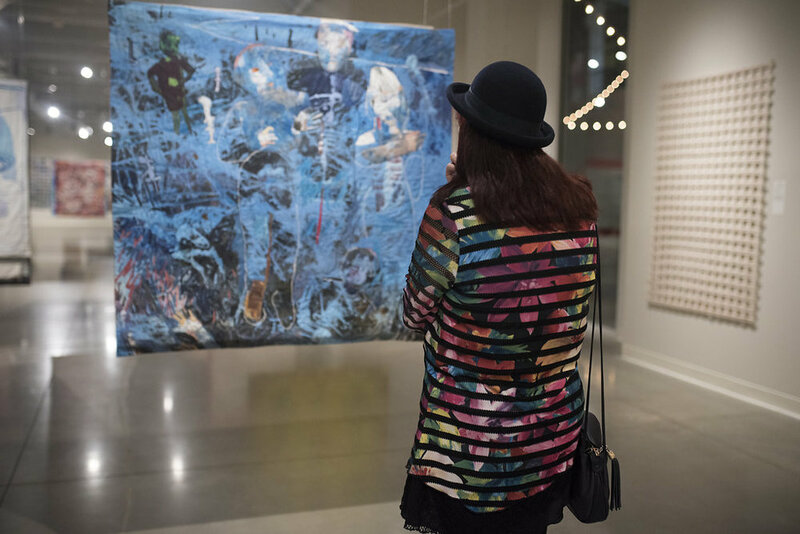 The Innovations in Textiles collaborative dates back to 1995 when several local key art organizations—Craft Alliance, COCA, Art Saint Louis, and the Saint Louis Art Museum—joined together to create a collaborative event designed to celebrate fiber art and artists. Innovations in Textiles was originally presented biennially, but in 2015, the group began presenting the event every four years. From the 4 founding organizations back in 1995, the collaborative has expanded to include over 40 participating regional venues for our 2019 event. Additional participating venues welcome. To participate, email us!